The University’s Green Labs program welcomed spring by hosting a three part event series throughout March to feature the three “R’s” of waste management: Reduce, Reuse, and Recycle. The Green Labs series focused specifically on applying these practices in research-intensive spaces. PhD student, Laurie Gray, sets up an experiment in the Hammerskjöld-Rekosh Lab on the seventh floor of Pinn Hall. Their lab participates in vendor polystyrene reuse programs. A webinar hosted on March 1st explored “Lab Minimalism” as a means for reducing lab waste and was presented by science writer and editor of Labconscious® Blog, Nicole Kelesoglu. In her webinar, she outlined the benefits of environmentally preferred purchasing and sharing expensive lab equipment within an institution. When purchasing lab materials, the environmentally conscious researcher should look for products with multiple verifiable green features that are also matched to your location’s waste disposal systems. For example, UVA Recycling accepts tip boxes, so researchers can order these materials knowing that once used, it will be reliably recycled. In contrast, expanded polystyrene (“Styrofoam®”) is not accepted, so shopping from vendors who provide free return shipping for the reuse of expanded polystyrene (ex., New England Biolabs, MilliporeSigma) will help to keep these materials out of the landfill. Going green whilst performing complicated research may sound like a distraction, but Nicole clarifies that with a little initial effort, minimalism clears distractions and allows researchers to access the materials they need more readily. Maintaining current inventories, using high-density sample or reagent storage, and discarding expired or unusable materials helps to streamline lab workflow and can extend the life of expensive equipment such as ultra-low freezers1. The University of Michigan, Ann Arbor, reduces their waste and annual costs through their ChEM Resuse program, in which campus researchers can contribute to and shop from a repository of unexpired and unused chemicals, equipment, and materials. Over 200 labs participate in the program that saves an estimated $250K per year. Similarly, a case study performed at CU Boulder showed that 16 labs contributing to a shared cell culture facility directly offsets costs to participating scientists in the Biochemistry Division ($195k / year) and Facilities Management ($58k / year)2. Here at UVA, the School of Medicine hosts a webpage for the Office of Research Core Administration to facilitate the use of shared cores and equipment available to UVA scientists. Green Labs hopes to expand these applications to all researchers across different schools and programs. After learning about waste reduction, a “REUSE! Swap” in Pinn Hall on March 15th allowed donating labs to clear clutter and make way for functional research space while receiving labs saved money on costly materials, putting otherwise idle tools to work (the Swap excluded hazardous materials, University assets, and capital equipment). At the end of the one-hour drop-off / pick-up period, remaining materials were donated to the Medical Equipment Recovery of Clean Inventory (MERCI) programon the ground floor of the Primary Care Center. Because MERCI is primarily used by UVA medical professionals, research staff may not be aware that they also accept materials for lab research. MERCI is more than saline drips and gauze. They also stock items like unused pipette tips, shaker clamps, freezer racks, well plates, petri dishes, lab glassware, and a host of other experimental tools. Green Labs encourages researchers to shop at MERCI (open Thursdays from 9am to 4pm, Primary Care Center, G102) before ordering new lab supplies. Other resources to be aware of are the Reusable Office Supply Exchange (ROSE) run by UVA Recycling. Needing office materials? Find it for free with ROSE who hosts their hospital “ROSE Closet” every third Tuesday in the main hospital Dining Conference Rooms 1-3. You can also visit the Recycling warehouse during normal business hours to shop the full inventory. Similarly, UVA Facilities Management just launched a Reuse Store where individuals, departments, and community members can shop for University-owned unneeded property such as desk chairs, file cabinets, tables, shelves, and other items. Inventory is free to University employees repurposing the items on grounds, and are for sale at a significantly reduced price when being taken off grounds for personal use. When material consumption is necessary, as is often the case in research labs, recycling helps reduce landfill waste. The final installment of the three-part series, “RECYCLE! Talk”, started as a networking session for labs to discuss safe and effective recycling of lab plastics. However, leading up to March 29th, the Green Labs program sought to take this session a step further, making it part of a larger waste diversion trial designed for lab spaces. The Laboratory Recycling Pilot Program on the seventh floor of Pinn Hall assessed lab plastics diversion while also answering a demand for consistent pick-up services and clear visuals to illustrate safe recycling. With the help of UVA Recycling and Environmental Health and Safety, this month-long pilot assessed whether researchers would recycle more plastic after Green Labs provided enhanced communications in the space. 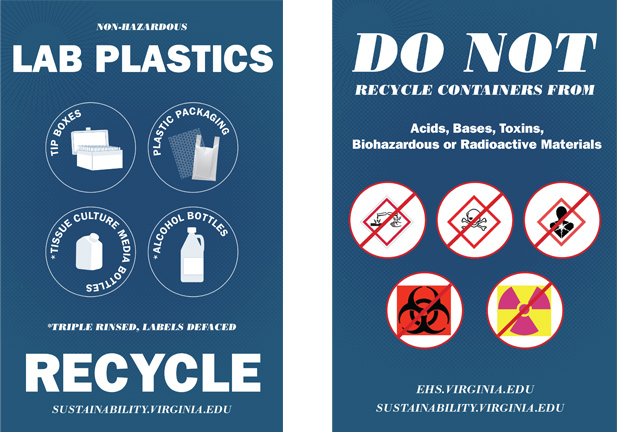 Newly designed lab-specific recycling signs outlined which plastic materials are acceptable and new recycling bins provided more space for frequent collection by UVA Recycling. The Program was a success and UVA Recycling estimated a 10% increase in plastics collection on the seventh floor of Pinn during the month of April (2018). Signs and new recycling bins will remain in place and Green Labs hopes to expand this program to other lab buildings on campus. The Office for Sustainability designed new visuals to improve safety and clarity for researchers wanting to recycle more plastic waste. Want to learn more about sustainability in labs? Email greenlabs@virginia.edu or visit us on the web! 1 Hermuth-Kleinschmidt, 2018.International Freezer Challenge: Who Saves the Most? 2 Greever et al. 2018. A case study of the Biochemistry Cell Culture Facility at the University of Colorado Boulder: avoided costs and other benefits resulting from shared equipment in collaborative research space. This article originally appeared in UVA Sustainability News and is re-published here with permission by the author.